Could not load file or assembly 'Microsoft.Data.Services.Client, Version=5.0.0.0, Culture=neutral, PublicKeyToken=31bf3856ad364e35' or one of its dependencies. The system cannot find the file specified. Calling assembly : Microsoft.WindowsAzure.MediaServices.Client, Version=1.0.0.0, Culture=neutral, PublicKeyToken=31bf3856ad364e35. LOG: Attempting download of new URL file:///C:/Workspaces/Windows Azure Media Services SDK Samples Project/C#/bin/Debug/Microsoft.Data.Services.Client.DLL. LOG: Attempting download of new URL file:///C:/Workspaces/Windows Azure Media Services SDK Samples Project/C#/bin/Debug/Microsoft.Data.Services.Client/Microsoft.Data.Services.Client.DLL. LOG: Attempting download of new URL file:///C:/Workspaces/Windows Azure Media Services SDK Samples Project/C#/bin/Debug/Microsoft.Data.Services.Client.EXE. LOG: Attempting download of new URL file:///C:/Workspaces/Windows Azure Media Services SDK Samples Project/C#/bin/Debug/Microsoft.Data.Services.Client/Microsoft.Data.Services.Client.EXE. 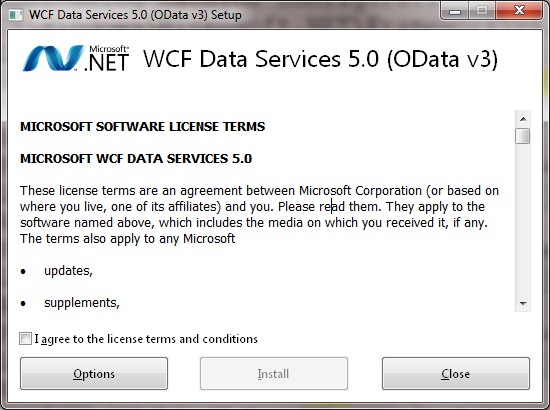 It seems the Media Services DLL is dependent on the out-of-band WCF Data Services OData assembly v5.0.